From amatriciana to hot bread croutons: the cheek or “buccularu” of Suino Nero dei Nebrodi, the authority of tradition! We obtain this specialty from the cheek or jaw of the Nebrodi Black Pig. It has the shape of a triangle, and even today at the ends it has the twine for seasoning. Why? Because according to the culinary tradition of the Nebrodi it was seasoned hanging from the roof. The 75 days seasoning gives the product a really tasty savour. The tanning of pepper and wild fennel are used to flavour the product. As I told you before it is a very tasty and versatile ingredient. There are many uses in the kitchen. 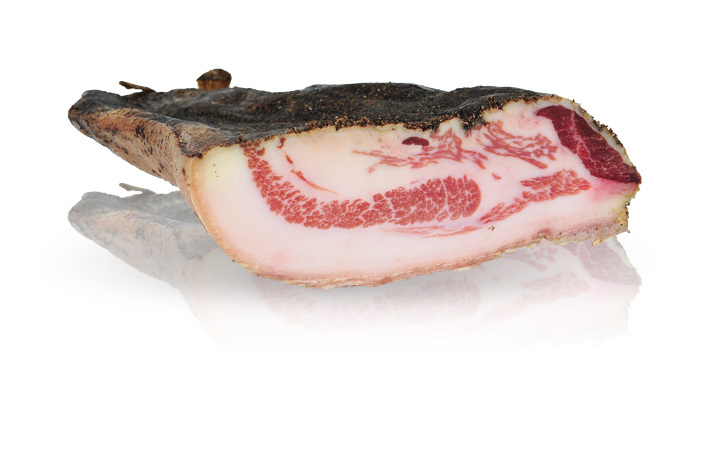 Well of course our Nebrodi black pig cheek can be used in amatriciana pasta. Would you like to know a better recipe? Spaghetti broad beans and bacon … or better artichokes and bacon. What about using it with fish? Try it with swordfish or shrimps! Mixing ‘sea and mountain’ is the better thing for your palate. Appearance: Piece of meat from the pig’s cheek, pear shaped with a rind on the lower surface. Trivia: Its name is derived from the dialect word “Buccularu “ meaning check of the pig.